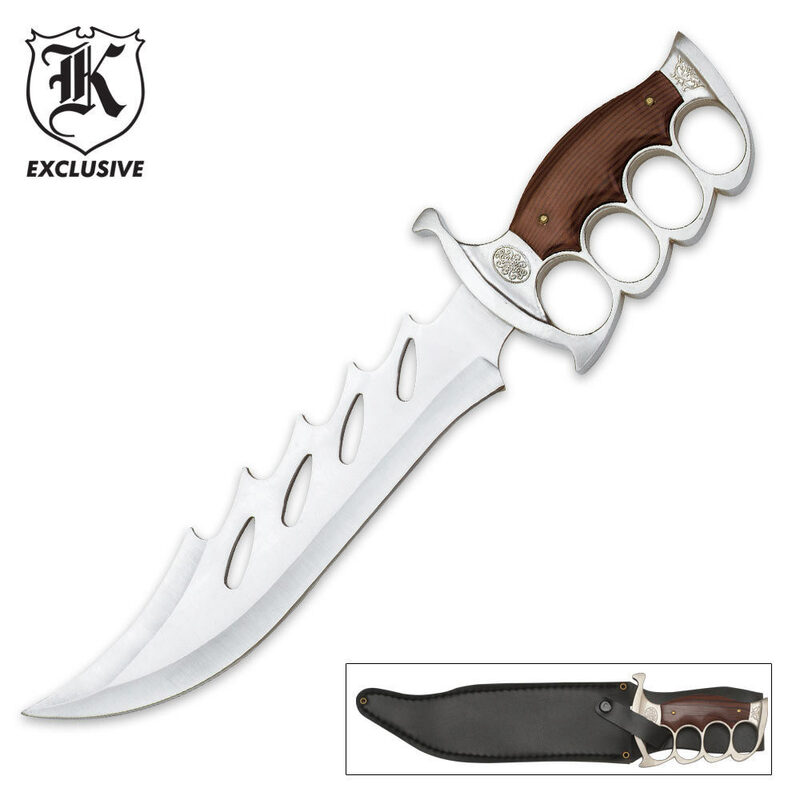 Hungry Hank Bowie Knife | BUDK.com - Knives & Swords At The Lowest Prices! The Hungry Hank Knife is one hefty, mean-looking bowie! It has a very beefy 9 3/8" 420 stainless steel blade that features balanced holes and backside cut-outs. The metal and faux wood handle has a metal finger guard and pommel in the style of a classic trench knife. A premium sheath is included. Just got the Hungry Hank Bowie Knife today looks pretty kool but not very well made very light blade looks like pot metal handle fits ok got it in a mystery deal glad I didn't pay for it I think the best thing you can do with this is remove the blade and use the knuckle guard handle for a pair of brass knuks for that it got 2 stars. It looks pretty scary but if take a better look you'll see that it's just put together poorly. 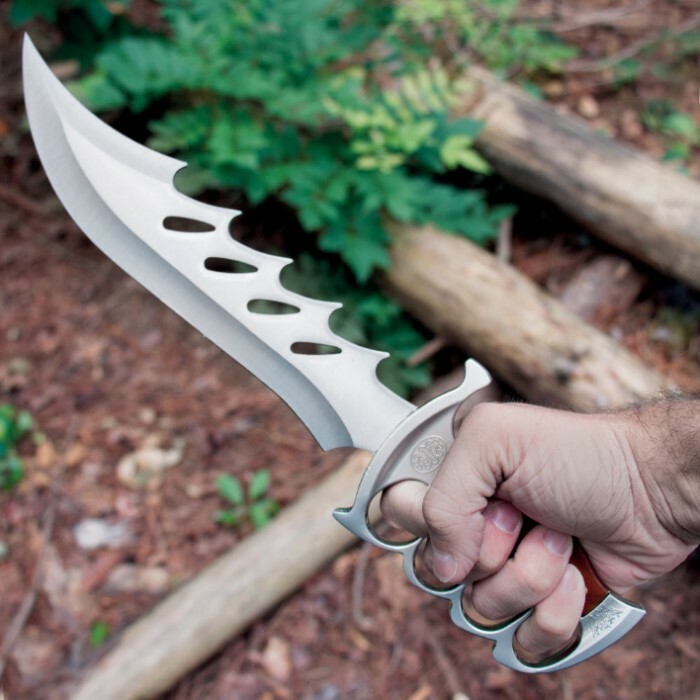 It's solid for the most part but I'd be scared the zombie I was stabbing with it would just snap the blade off the cheap handle and backhand me for buying a cheap knife from Budk. I bought it when it's was cheap and you get what you pay for but there is only a question in price when there is an absence of value and I refuse to lie like the rest. No this is not a good buy. dont believe the negative trash talk on this knife, i have one, its a collector knife, and it will draw attention if you show it off, any knife will break if you abuse it,even the high dollar knives break, but these bud k knives are great, they look tough, and anyone who see mine, wants one, i have had to buy several just to give them as gifts, or etc.. and i have used them hard, and they have held up, DR,DETROIT, CLIFF LYNCH, says, bud k is the best, forget the rest! Got what I paid for. Sharp. Looks good. Sheath is very low quality. And handle is some type of composite or plastic. Looks amazing though. This is a really cheap knife. The handle is plastic. It is not full tang, broke the first time I used it. Just it`s appearance can settle a dispute! Feels solid and well made. Only wish handle was wood instead of plastic.